In 2015, I asked readers to list their favourite historical fiction titles for the first time. Being a little more experienced I limited participants to three choices – clearly a challenge for many. What has emerged is more than 1700 different titles – and no, I won’t be listing them all today – and some clear favourites. I’ve grouped them into three parts: titles with more than 40 mentions, titles with 20 to 39 mentions and titles with 10 to 19 mentions. Given variations in spelling and the ability of readers to recall exact titles, it’s been a challenge to count the entries and I’ve spent weeks checking and double-checking to be as accurate as possible. I have chosen to put the titles in order but not to show actual counts since I remain concerned about absolute accuracy. For your information, FC means the book is concerned primarily about fictional characters, while FHF refers to famous historical figures. 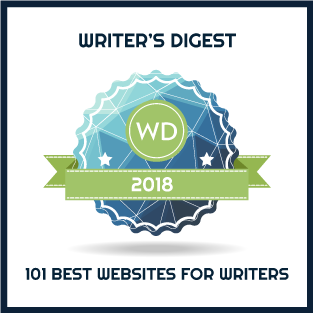 ** Despite a comment advising participants that Jane Austen did not write historical fiction, Pride and Prejudice attracted more than ten mentions. Participants could not restrain themselves from mentioning series and so I have done my best to accommodate them in the final counts. If you spot any inaccuracies, please let me know. M.K. Tod writes historical fiction and blogs about all aspects of the genre at A Writer of History. Her latest novel, TIME AND REGRET will be published by Lake Union on August 16, 2016. Mary’s other novels, LIES TOLD IN SILENCE and UNRAVELLED are available from Amazon, Nook, Kobo, Google Play and iTunes. She can be contacted on Facebook, Twitter and Goodreads or on her website www.mktod.com. What do FC and FHF stand for? Sorry, I wasn’t quite awake. I see it now. I’ve read most of these books, or if it is a series, at least the first book in it, if not the whole series. These writers set a high standard for the rest of us to aim for. A high standard indeed, Eileen!! Thank you so much for doing this – it’s really interesting and valuable. Oh no!!! How embarrassing. I am truly sorry, Elizabeth. And I have a signed copy!! Will fix straight away. I am saddened that there were not more books mentioned by Edward Rutherfurd. Yes, Sarum was superb but what about his books “London” or “Paris” or “New York” or “The Forest” or the two book Dublin/Ireland set? Hi Mikki – thanks for stopping by. Paris is one of my favourite Edward Rutherford novels and I had the pleasure of interviewing him in person when it released. London and New York were mentioned 3 or 4 times, but I can only find one mention each of The Forest and Princes of Ireland. He’s also mentioned as a favourite author a number of times, however, I haven’t done the work yet to publish those results. I missed the poll, but I’m glad to see Mary Renault and Dorothy Dunnett at least on the list. Do you think that some series authors did less well because votes were split among their books? For example, I love Diana Gabaldon but Outlander is not my favorite, although since it is the first of the series, I’d be tempted to use it as a surrogate for the whole series. Interesting point, Mary Sue. I suspect you are right. I may do some further analysis along that point, although I also have favourite authors to tabulate! How do you pick your survey takers? Are you going to post all the results at some point? I have read several books on the list. SK Penman and Elizabeth Chadwick are favorites. Pillars of the Earth and Colleen McCollough’s Rome/Cesar series are both masterpieces. Thanks, you created a great to-read list. Fascinating, as always! Thanks for putting it all together for the rest of us. Thanks, Lausanne. I was intrigued to see the titles and had little preconceived notion of which ones would emerge, other than being fairly certain Outlander would be there! Historical Romance and Historical Fiction from certain eras are my favorite genres. Check Out Who Made this List!!! I have not read Diana Gabaldon’s books (beloved by many of my friends). Do they strictly fit in as historical fiction? I know that the heroine enters the past through an ancient stone circle (which I personally find kind of weird; as an archaeologist I have a bit of a ‘thing’ about stone age megalith builders being made into magic users, Atlanteans, aliens etc etc.) Is that the only fantasy element? I know of other authors who weave a bit of fantasy into their historical fiction – perhaps a split genre? Perhaps because it is not considered historical fiction ??? Hello again, Allan. Thanks for your interest. Are you a fan of The DaVinci Code. For the survey I used the definition the Historical Novel Society uses for historical fiction. “To be deemed historical (in our sense), a novel must have been written at least fifty years after the events described, or have been written by someone who was not alive at the time of those events (who therefore approaches them only by research).” In terms of survey participation, more than 2000 people responded to the survey – most of them reached through social media. I did not contact them individually, but put the word out that the survey was open for responses and people passed the survey link along resulting in responses from all over the world. 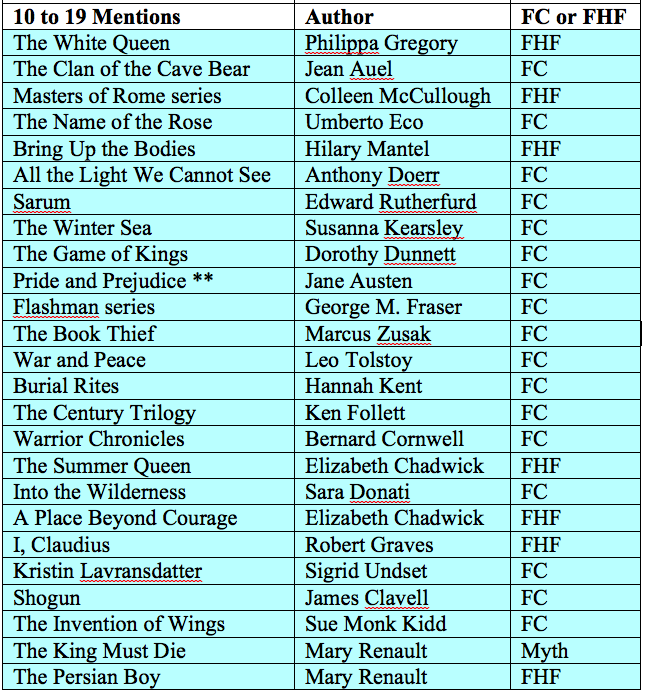 This is the third survey I’ve done and the first time I have asked participants to list their favourites historical fiction. As you can see from the titles in the list, many are written about events that occurred a very long time ago.